Monographs remain an essential part of the scholarly communications landscape for humanities and social sciences researchers – allowing them to explore ideas in depth and over time, acting as important markers for academic reputation, and often being their primary scholarly output. But where does the monograph fit into UK government requirements for free and open access (OA) to publically-funded research? While the focus of this initiative has been giving better access and discoverability to the public of scientific research and papers, a question mark hangs over the feasibility of a transition to OA for the academic book. 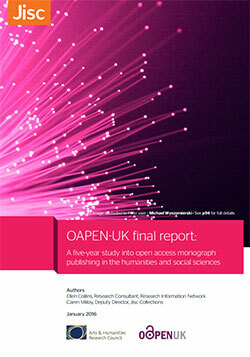 This was the driving force for OAPEN-UK, a project funded by Jisc and the Arts and Humanities Research Council (AHRC), which undertook a five-year study into OA monograph publishing in the humanities and social sciences. Examining the attitudes and perceptions of funders, researchers, publishers, learned societies, universities and libraries, our study reiterated the deep strength of feeling and connectedness that each group has with the monograph, especially in terms of identity and reputation. It also found that while many think open access is a good idea in principle, there is uncertainty about how easy it would be to implement the necessary policies and systems to support OA monographs. While achieving a coherent OA strategy for monographs is not without its challenges, based on our research we’ve arrived at a series of recommendations that have three core principles at their heart. Research in the humanities and social sciences is diverse, as is publishing; both the methods by which researchers and their monographs are funded, and the publishing process itself, can take a variety of forms. This demands a range of OA business models that take into account the subtleties that exist across the research, the monograph and the stakeholder. A single model or one-size-fits-all approach is not sufficient, nor is it the aim. As well as the various stakeholder groups we consulted who I mentioned earlier, our research highlighted the number of other vendors, third parties and system providers that also needed to be involved in dialogue about open access models for monographs. Presently, these latter groups exist within an ecosystem whereby performance is measured on delivering paid-for and printed content. Consequently, the current system does not support the distribution and discoverability of OA monographs, and also makes the tracking, identification of trends and impacts of OA hard to isolate. Continued collaboration, including cross-stakeholder partnership and co-ordinated projects, is crucial in adapting systems and processes to support the effective production, dissemination and discoverability of OA content. A major part of this will involve identifying each aspect of the book publishing process – from commissioning, third part rights and contracting, to production, distribution, marketing and sales – and working in partnership to develop best practice, standards and new models that everyone can get on board with. The path to OA for monographs is not a smooth one. Various factors interplaying – including recognising that monographs are different to journals, and each other, that there are subtleties in relationships, that a variety of perspectives exist even when you share a common goal; and that many models are better than one – all make for a rather muddled environment. What’s key as we continue along this road is that no-one is left behind through confusion, misunderstanding or lack of information. As the debate continues there needs to be understanding and recognition of what is important to each stakeholder, through honest and transparent communications that frame the value proposition for OA monographs based on what is important to them. When knowledge is shared on this basis it helps stakeholders to make informed and considered decisions about business models for OA monographs, which will be backbone of a successful transition. We need everyone with an interest in monograph publishing to come together and join the conversation. Read the report and recommendations, and get involved by contacting me at caren.milloy@jisc.ac.uk or following me on Twitter @carenmilloy. I contribute to the strategic direction of Jisc Collections, with a key focus on e-books and monographs, to ensure it delivers value to our members and supports licensing and negotiation. I lead Jisc Collections’ research activities ensuring we achieve the best outcomes in our negotiations and licensing work, evaluate developments in scholarly communications and identify opportunities on behalf of universities. Through continued collaboration I will take forward the recommendations from the OAPEN-UK report. I also lead our communications and am a member of the senior management team. Exploring open access to save monographs, the question is – how?